When I think of meatloaf unfortunately the image of a huge, sweaty singer comes to mind. Once I move past that sickening thought, I see my one of my favorite meals (if done right). Whether you are someone who loves meatloaf (the food) or just the mention of it makes you sick, we can agree that there is usually some leftovers and it never taste the same after heating it up in the microwave. 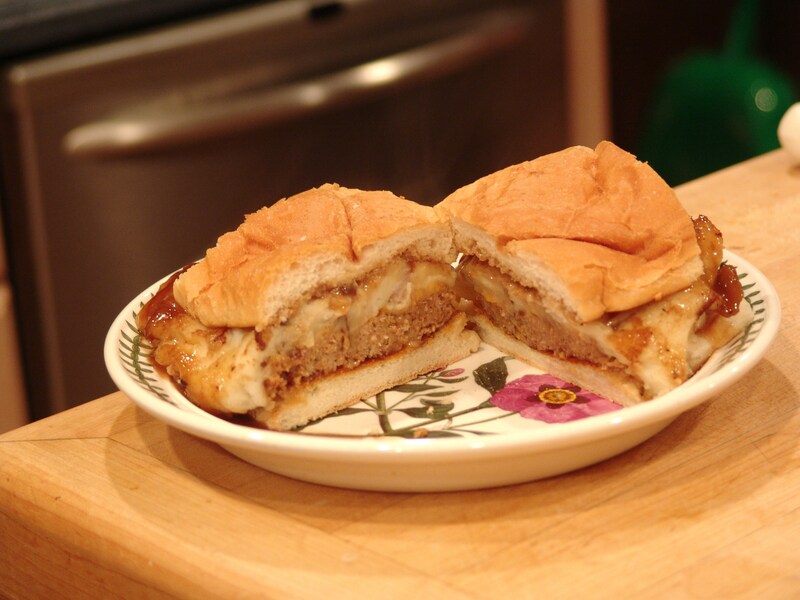 When I was in Connecticut Matt made this sandwich that is a surefire way to put that leftover meatloaf, mashed potatoes and gravy to good use. 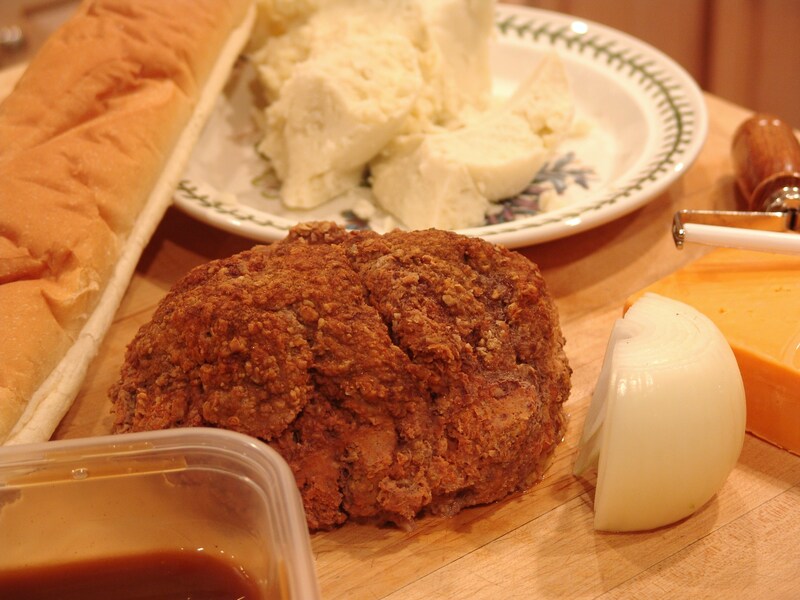 Looking at these pictures has me considering going the store and buying stuff to make meatloaf just for the leftovers. Heat a large skillet or griddle to med-high. Add butter griddle then place some mashed potatoes to the griddle (enough to fit the size of your meatloaf slices). You want to start with this step first because the center of the mash will take longer to heat. Lightly butter the griddle and add a slice of meatloaf. In another area of the griddle add butter and garlic. Once melted add your bread. When the mash is brown, flip it over and do the same for the meatloaf and add a slice of cheddar to the meatloaf. Add some onions and butter to the griddle and cook until translucent. If the onions are cooking to fast and become burnt, you can remove them and add them back later. 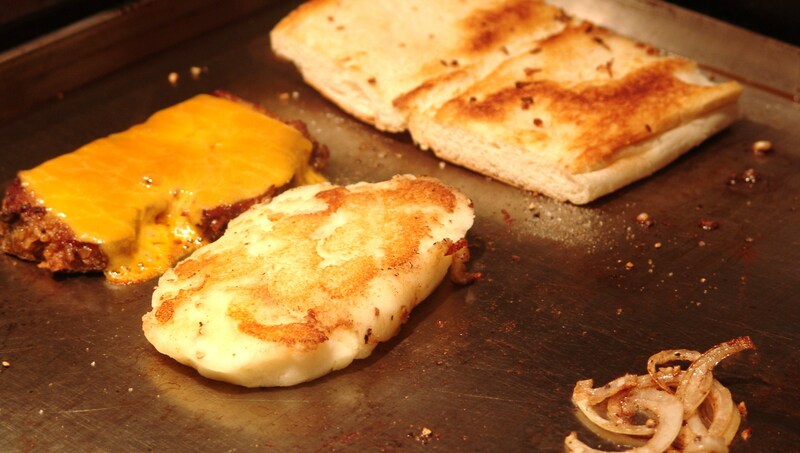 When the bread is toasted remove it from the griddle to your serving surface. Place the meatloaf on the bread then top with the mash. Pour some gravy over the onions that are cooking on the skillet and mix for a few moments. Then add the onion and gravy over the top of the mash and prepare for food coma. The day that I ever become hip… please shoot me and put me outta my misery! Yum! 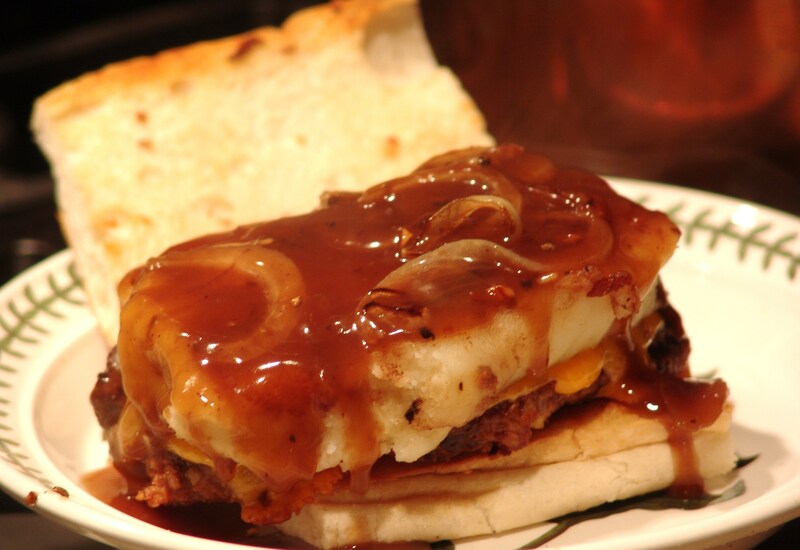 That looks like the best way to eat any meatloaf, leftover or no!